Deadpool is a triple threat. He can fight, he can wisecrack, and he knows how to dress for success. Just look at that marvelous getup! It’s simple, yet elegant. It’s colorful, yet subdued. It looks like the uniform of a battle-hardened mercenary… but it also looks a little like something a graceful ballet dancer would wear. It combines the best parts of a ninja outfit and a pirate! Compare that to the kind of stuff Cable’s been wearing these days, and you can really get a full appreciation of Wade Wilson’s style sense! Maybe you’d like to try being like the Merc with a Mouth, yourself. Perhaps you want to try wearing some Deadpool style of your own! You could try to put together your own suit, but why not take the more comfortable route and get this Deadpool 2nd Skin Adult Costume! This jumpsuit is one spectacular looking suit! It’s made out of a spandex blend material that stretches to fit. That means that this handy outfit is skin-tight and is ultra-flexible! The suit has a red front, with printed muscle details on the chest and abs. It also has a printed gray harness in front. The waist has a printed utility belt and Deadpool’s signature symbol in the middle. The legs even have a printed knife holster on the side. The final piece to this outfit is the mask, which faithfully recreates the look of Deadpool’s mask from the comic books. When you wear this Deadpool jumpsuit, you’ll be a triple threat too… provided that you already have some ninja moves and some pretty awesome comebacks. Actually, you might want to jot down some one-liner material on a notepad before you hop into this costume. 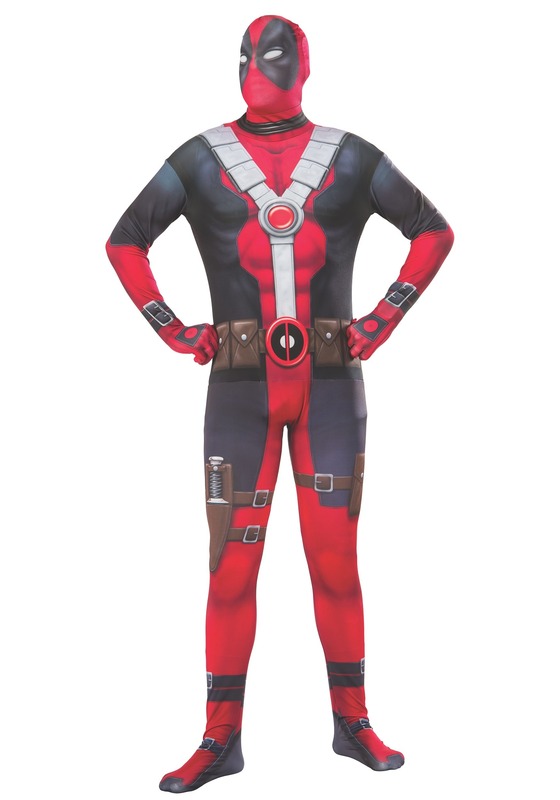 People are going to expect some top-notch wisecracks when you dress as Deadpool!